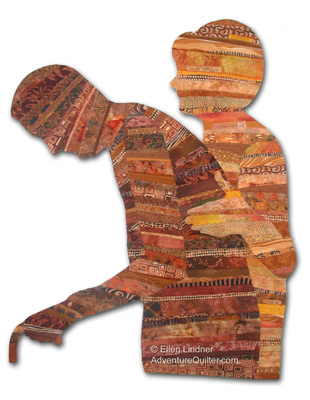 Ellen Lindner’s fabric collage, “Caring,” will soon be on display at the Crealdé School of Art in Winter Park. It will be part of the exhibit called “Mid-Florida Quiltmakers: Commemorations and Connections. This display is running in concert with The Sum of Many Parts: Quiltmakers in Contemporary America, an international touring collection. Both shows are juried and they’ll run from September 11, 2015 to January 18, 2016.